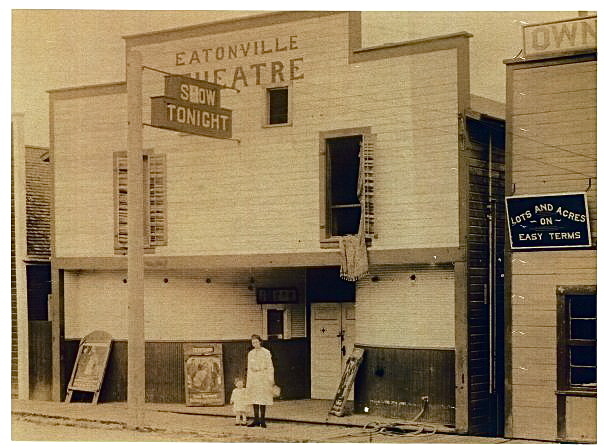 The first Eatonville theatre was built in 1915 on Mashell Avenue by Frank Van Eaton in 1915. Electricity hadn’t made it’s way to town yet. so a 2-cylinder kerosene generator powered the silent movies. A piano supplied the score, and the same pianist sometimes sold popcorn. Early pianists included Mrs. A.W. Fairburn, Miss Ethel Stinnette, Mrs. Fix and Fay Williams Duke. At the time this picture was taken in 1920, Douglas Fairbanks would have been one of big screen starts.